Today’s printable is handy in a couple of different places. I keep a copy of the Password Keeper in our budgeting notebook and in our Legacy Notebook, and then there’s a page like this in my blog planner as well. I designed this one out of necessity. The rough draft came about when I was preparing to leave for basic training in 2009 and realized that Hubby had no idea how to pay our bills or access our checking accounts online. This handy little cheat sheet made his life easier while I was gone. It made sense to add a copy to our Legacy Notebook as well so that if anything were to happen to us, the information would be available to whoever might need it. 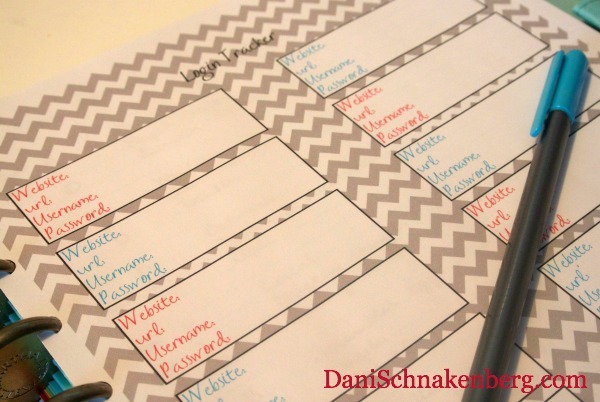 And let’s face it, if you’re a blogger, you have a million and ten more passwords to remember, and writing them all down is a necessity. It also solves the issue of “Wait, I already have an account for this? !” Please tell me I’m not the only one with that problem!